I am constantly fascinated by how much emergency medicine has changed, and is continuing to change, country by country, all around the world. Fifty years ago, the world had little to no focused emergency medicine systems development: no specialty training programs, no residencies, no specialty recognition, no EM professional organizations, no EM research, no EM finance or reimbursement, no EM legislation or health policy focused on EM, or EM health policy or public health support. Yet look how far emergency medicine has come in these past 50 years. Last year, emergency medicine turned 50 years old in the UK, and turned 50 this year in the USA. There are now an estimated 55+ countries where EM is recognized as a full specialty – 10-15 countries with so-called mature EM systems, another 30-40 with EM systems currently in development. (Over 100 countries still have little to no focused EM and emergency care systems development.) One of the standard bearers for global emergency medicine development is the International Federation for Emergency Medicine (IFEM), which serves as further evidence of the quickening pace of EM systems development, and of the changing global phases of EM development. Just this past June, IFEM turned 27 years old. A lot has happened in the world of emergency medicine in the past 26 years. For a detailed timeline, check out the IFEM website. In the early period of EM from the mid-1980s until approximately 1999, IFEM consisted of four founding members – Britain, Australia, Canada and the USA – and met every 2 years for the International Conference in Emergency Medicine (ICEM). This first chapter of the IFEM represented the major, mature EM societies in the world from countries with focused, more-highly developed EM, provided biannual EM conferences for networking and education, and ended in 1999 with the admission of the first outside EM societies from outside the first four founding members. "As emergency medicine continued to develop across the globe, membership of the IFEM was opened to other organisations that represent emergency medicine in their country and this membership now comprises nearly over 65 organisations worldwide…"
This second chapter of IFEM—from 1999 to 2018—represents a chapter of exponential growth of countries continuing their EM development curve, and growth within EM societies themselves. As of this year, IFEM has over 40 full members (countries where EM has been recognized, an EM society exists and EM training programs exist); approximately 20 affiliate members (countries where EM or EM societies or EM residencies may not yet be recognized, or countries with more than one EM society); and a dozen or so ex-officio members (representing regional EM societies such as Europe, Asia, Africa, or other regional/professional organizations). During this recent chapter, IFEM has worked to create dozens of global consensus curricula for EM for students, residents and faculty; curricula for EM ultrasound, EM pediatrics and other clinical areas; formal white papers and position statements on EM quality and safety, EM testing and assessment, EM research and EM specialty society development, and the value and efficacy of EM as a system. Early steps have begun with IFEM interacting with the WHO and with other global groups to further advance EM and emergency care development. 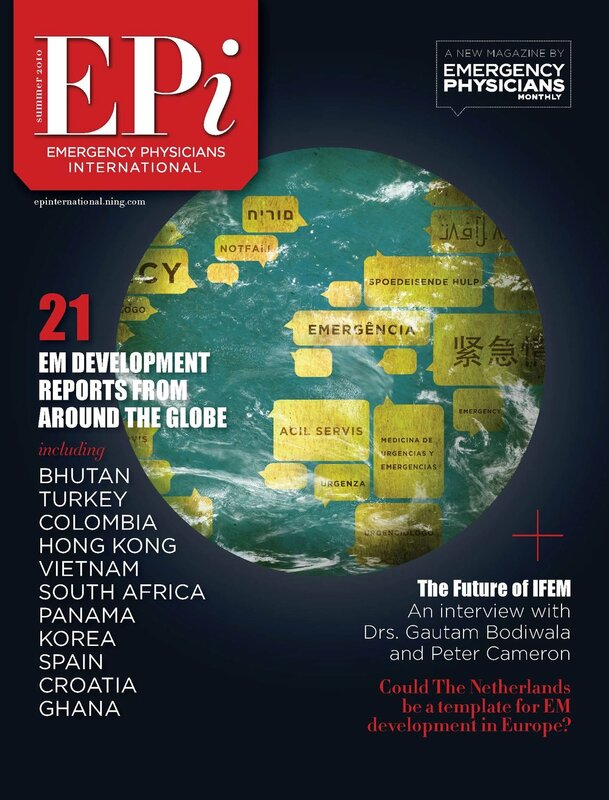 Further, IFEM has become the peak organization representing EM and EM development in the world, allowing local EM professionals to be exposed to experiences and cooperation from EM societies elsewhere in the region or from around the world. Recently, however, IFEM has realized that it has to enter a new, third chapter of its own growth and expansion. No longer merely a “gentlemen’s club” of four founding members from its first chapter, and outgrowing its function during its second chapter as a collection of new and developing EM societies from around the world, IFEM and many global EM leaders are realizing that IFEM needs to change its nature and scope in order to move into the future. No longer should IFEM simply represent the many and varied EM societies around the world, and provide a degree of interaction and cooperation. The new and next chapter for IFEM needs to include active encouragement and active participation in local, national and regional EM development. Fifty years ago, the world didn’t know how to build local and national EM societies, and fifty years from now, EM and emergency care systems will likely be in (nearly) every country, much the same as cardiology, surgery, and pediatrics are now. IFEM has represented this organic, mostly disconnected, mostly uncoordinated growth of EM systems country-by-country-by-country. Most of the collaborations in global EM has been on a volunteer basis, championed by a handful of locally-based but global-minded, sometimes visionary – and definitely obsessed in my case – collection of individuals. We've contributed to IFEM and to EM development on our free time, on a volunteer basis, on our vacations or academic protected time. But IFEM is realizing that the days of building EM and emergency care systems on national and regional scales borne on the backs of the protected time of a small handful of academic emergency physicians need to be in the past. The world needs an organization that can build comprehensive EM and emergency care systems on national and regional scales, and an organization that is engaging in this development on purpose, professionally, full-time, and with the time, energy, finances, dedication and passion that such a global undertaking deserves. The world knows how to build many meaningful and valuable projects on national and trans-national scales (i.e. electric grids, telecommunications systems, banking, transportation systems, tourism, etc.). IFEM simply needs to bring together EM professionals with local and national governments, non-profits, bankers, attorneys, corporations, investors and business organizations, and build EM on local, national and regional scales. We simply remove “national banking” or “national electric grid” and replace those modules with the modules of “national EM systems” and begin to build comprehensive EM systems on purpose. This third chapter of IFEM is just now beginning, and is represented by the formation and incorporation of several separate organizations associated with the IFEM, namely the IFEM Foundation and the IFEM Institute. The IFEM Foundation is a 501(c)3 not-for-profit organization dedicated to small and large-scale fundraising for local and global EM development. The IFEM Institute is a newer organization, also not-for-profit, dedicated to engaging in large-scale EM development contracts, projects, cooperation and collaborations between IFEM and national EM societies, major hospital networks, national governments, ministries of Health, Finance, Education, Tourism or other groups interested in comprehensive, full-scale EM and emergency care systems development. Already pursuing a dozen projects and proposals, the IFEM Institute anticipates forming a common pathway for outside organizations to work with IFEM and to tap its vast warehouse of experience, legitimacy and “know-how”, in order to build EM and acute care systems around the world. As my Irish forbearers offered as a blessing and a curse: “May you live in interesting times.” Moving into perhaps the most interesting times in global EM development so far, IFEM and the field of global emergency medicine development are alive and well, and moving forward to their next chapters of growth and expansion, to best meet the needs of global EM systems development country by country, society by society, patient by patient, in order to bring the best emergency care to the people who need it the most.